Last night H had a night out with some friends and they had a little Secret Santa too. I found a very nice restaurant in Farringdon, London and kept it all secret from the girls as to where we were going! Meeting them in a pub for some pre-dinner drinks and keeping them in the dark, until it was time to go. We ended up in Little Bay, which is a lovely little restaurant, so I can thoroughly recommend it! A selection of starters, main courses and puddings later, we were all stuffed and even with a cocktail it was under £20 each! Bargain. Anyway, onto more important things, we had the great Secret Santa swap and due to all being around the dinner table, it turned into the not so secret Santa swap, but hey, it was nice all the same. There was a mini anglepoise lamp for Julie, a make-up bag with her initial on for Claire and a bag holder and a knitted Bando (a headband to you and me) for Maria, and for me a book on making vintage gifts!! They know me so well! 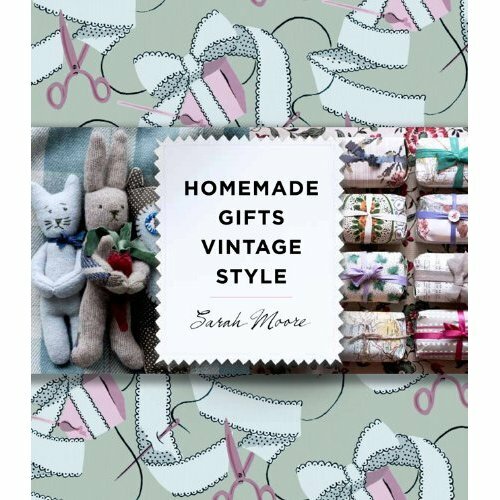 I am looking forward to making more than a few gifts from this lovely book! Are you and your friends doing Secret Santa this year? what gift have you bought?